challenge they can present. They are easily clogged by leaves and other debris and are often high up and hard to access, not to mention the time it takes to clean and maintain them. Also box gutters can leak in different ways when they are clogged or when they are clean which can make diagnosing the problem tricky. However the out of sight out of mind approach to box gutters can be even more painful than dedicating the time and effort it takes to keep gutters clean and flowing properly. In most cases the box gutters are built into decorative wood or sheet metal trims like crown molding, cornice trim, and corbels. These trims can be very expensive to repair or replace because tin smiths are few and far between and most of the older wood molding are no longer in production and have to be custom shaped. 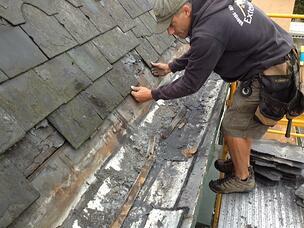 Here are the three most common scenarios we have come across over the years roofing and working on box gutters. Helpful Hint : You can use a leaf blower to quickly and efficiently remove debris and water from box gutter in order to complete a though inspection. Helpful Hint : If you have cleaned box gutter and drain leading to downspout but water still seams to be backing up you may want to check the downspout for clogs or even underground drainage lines meant to take water away from foundation. Water runs behind gutter. This is the most serious problem that can occur with box gutters because not only can trims become damaged, water often enters the home or building and damages the inside ceiling and inside of the exterior wall. This happens when the box gutters have been designed incorrectly and the front of gutter is higher or taller than the back. In an overflow situation water rises in box gutter and instead of spilling over the front of the box gutter on the sidewalk or street below the water spills over into the building. A few signs of water entering building are water spots in the corner of ceiling and wall, water damage to interior wall, brick turning white on outside of home, paint peeling off brick or stained, and exposed brick turning white or becoming discolor inside home. Helpful Hint: Create a maintenance plan, cleaning this type of gutter once in the spring and once is the fall is not even close to adequate. The gutter must be maintained very often especially when leaves are falling as they can stop up just about everyday especially if trees are near building or home. 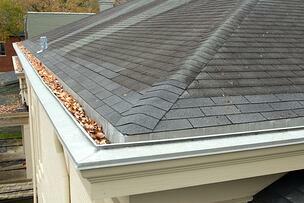 There are several repair options for box gutters that range from caulking and sealing to having box gutters lined. 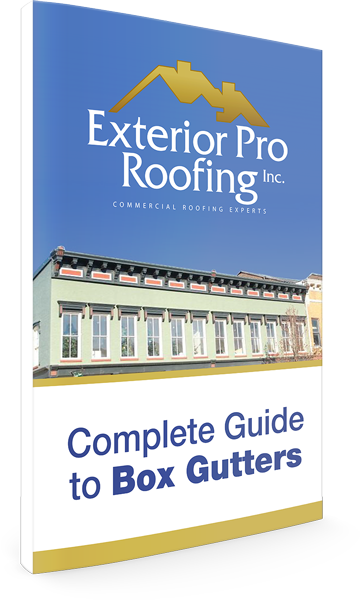 Here’s what we’ve found to be the most effective, long term solution to all three of the most common reasons box gutters leak. 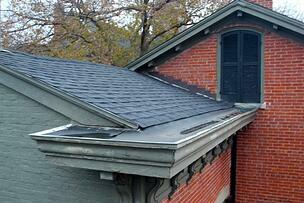 We use a PVC membrane to line box gutter in conjunction with a two pc trim detail over the decorative trim. The PVC membrane and two pc trim are commercial/ industrial roofing products that you typically find on building with flat or low slope roofs but the membrane works nicely in box gutters and is very durable. Here’s how it works. The PVC is a water proof, fabric rein-forced membrane that is strong enough to be tear and puncture resistant, but it pliable enough to take the shape of most all box gutters. Most importantly the seams are water proof and do not rely on glue but rather a hot air weld. 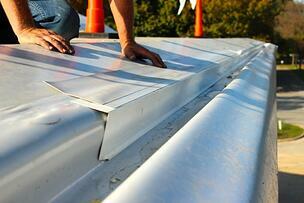 This type of seam is an industry standard in commercial roofing and known for it durability. This same hot air weld is what unites the drain boot to the membrane and keeps water flowing inside the downspout instead of around and outside the downspout. 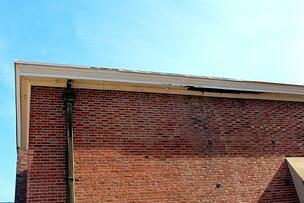 A box gutter correctly lined with a PCV membrane will not leak, scenario 1 fixed. If the membrane is ran up onto the roof behind the box gutter high enough ( 6”-12” inches depending on roof pitch) and tied in properly, water will not be able to back up into home or building as we see in scenario 3. Keep in mind that even though a PVC liner correctly installed and used in conjunction with a 2 pc compression detail can solve most problems with box gutters, but it wont clean your gutters for you. As will all building maintenance be smart and be safe.